Telugu Titans witnessed a collective effort from raiders Rahul Chaudhary, Nilesh Salunke and Krushna Madane as they defeated Puneri Paltan in a thrilling encounter. 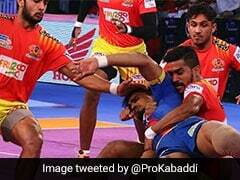 Telugu Titans defeated Puneri Paltans 28-25 in an inter-zonal clash of the ongoing sixth edition of the Pro Kabaddi League (PKL) at the NSCI stadium in Mumbai on Tuesday. The Titans witnessed a collective effort from raiders Rahul Chaudhary (8 points), Nilesh Salunke (6 points) and Krushna Madane (4 points) to register their fifth win of the season, while it was the seventh loss for Puneri Paltans from 14 games. Sandeep Narwal and Akshay Jadhav collected seven and five points, respectively for Pune. In the second match of the day, U Mumba outplayed UP Yoddha 41-24, maintaining their top spot in Zone A with 46 points. Earlier, Telugu Titans tackled Rajesh Mondal to open their account before their successful attempts saw them take a 5-1 lead in the first five minutes. Pune then changed gears, managing five points in quick succession to tie the issue at 6-6 in the eighth minute. The next two minutes saw both teams failing in stretching their lead. Telugu Titans then tackled Akshay to take a one-point lead before extending it to 13 points while their opponents were reeling at just eight points by the 14th minute. Both the sides then managed to pick three points each in the last six minutes even as Telugu Titans managed to lead 17-11 at half-time. Rahul continued to break their opponent's defence successfully, that took his side to 22 points by the 27th minute, while failed attempts by Pune left them at 13. The next four minutes saw Pune failing to move ahead as they were still at 13 points while the Titans marched to 25 points. Monu's successful two back to back raids gave some respite to Pune but their opponents were still 10 points ahead by the 35th minute. Telugu Titans were leading 27-17 in the last four minutes but Pune somehow managed a comeback grabbing two points to move to 19 points which also saw their opponents with just three men on the mat. Pune continued to show some fight in the final moments by inflicting an All Out as they moved to 24 points, cutting the deficit to just three points. Mahendra Reddy's successful one-point raid in the last few seconds was not enough to stop Telugu Titans as Rahul also raided successfully to help his side clinch the contest 28-25.